The following interesting and colourful account of railroading on the “Soixante” was written up by Travelling Engineer Van T. Sherman in “An historical & technical biography of the Twenty-first engineers, light railway.” published in 1919. It’s a great read! 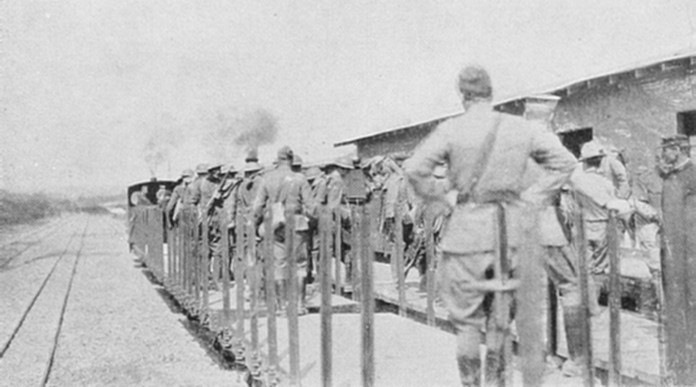 … It was before the St. Mihiel offensive. 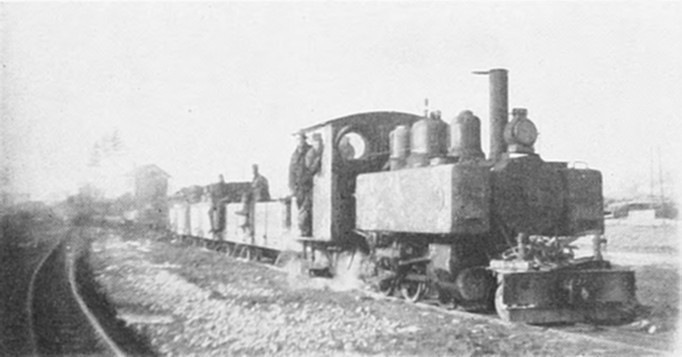 The "Slim Gauge" line from the railhead at Sorcy Gare climbed steadily its twisting way to Cornieville, eight kilometers away, and it was a battle for steam all the way, as from twelve to fourteen cars of rations and forage was quite a load for such a small engine. It was necessary for the engineer to stand up, manage the sand lever with one hand and unbalance the throttle with the other and the "Johnson bar" the best way that he could. The grade was the natural roll of the ground, so great care had to be taken to slacken speed with the steam jam brake to keep from turning over on the right angle curves. 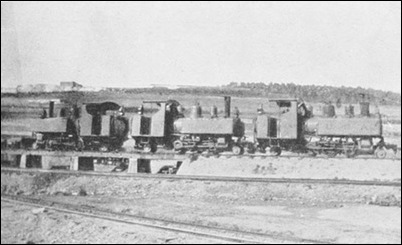 After battling thus with a fourteen load train, the engineer’s nerves and temper was on edge upon reaching Cornieville, so that he was in good shape to take the hill ahead, which was so straight up that it leaned back. The railroad also was on the edge of the wagon road, constantly jammed with military traffic and jam up against the houses on the other side — with old women chasing out into the track in their wooden shoes and babies playing "ring around the roses" right in the way. 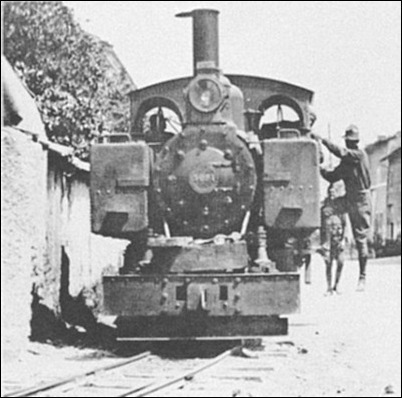 A pusher engine would tie on behind, and, after three or four slips, the little Baldwin would go after it. Momentum would be gained in the "sag", then take the hill, putting a barrage out of the stack that would shame a B. & O. hog in West Virginia. The leading engineer would offer up a prayer, toot his whistle and offer up thanks again if he got up the hill without getting off the track, killing some innocent bystanders or running into a loaded caisson. In respect to our small Baldwins, great care had to be taken to keep them on the track and to keep the engine from turning over. 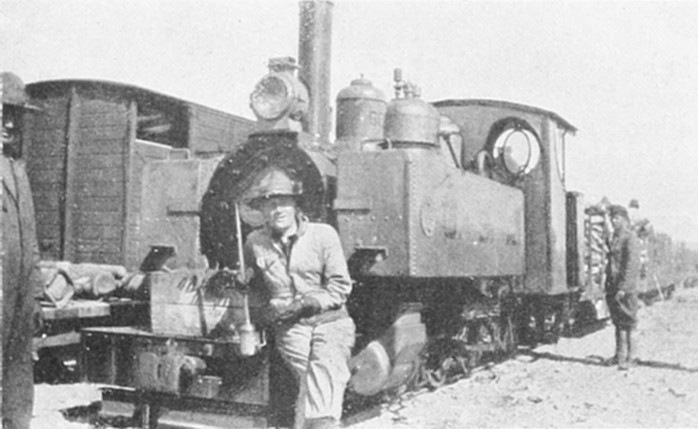 The engines were built with a straddle tank, with a connecting pipe underneath the boiler to equalize the water. The engines were a little high for a 24 in gauge and, therefore, a little top-heavy. In leaning, the water in the tank would rush over to the low side through the equalizing pipe, and it was quite a job for the engineer to decide whether to jump off or speed up to cross the bad place in the track. The roadbed was always very uncertain, often because the track was laid over recently filled shell holes and would give way after a rain. Many of our engines turned over on this account. Often at night heavy artillery, pulled by tractors, would cross over the track or run on it. The extremely heavy weight would bend the ties, throwing the track out of gauge and it would be very hard to detect it even in day time. Preparatory to the St. Mihiel drive, the wagon roads in the day time were practically deserted, as Fritz had his balloons up, but at night the roads were jammed, two continuous strings of trucks and artillery, one each way, and the railroad ran along the side of the road. Many times on dark nights the engines would run into the trucks, because absolutely no lights were burning. 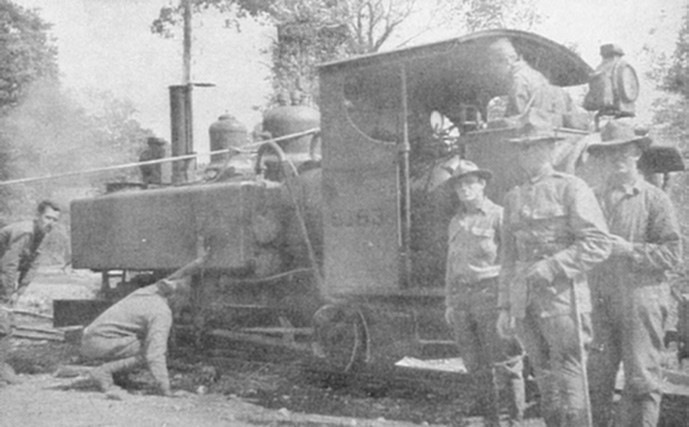 The artillery and the trucks did not know where they were, or whether or not they were near a railroad. A number of times a caisson would be very close to the track. The engine would clear, but the saddle tank would climb right up on the wheel of the caisson and tip over with no warning to the crew at all. An unsafe speed had to be made at many, many points, because the country was rolling and the track laid to conform with it. same time having water on the crown sheet in tipping over the top of the hill, not to drop a soft plug. The steaming properties of the engine would not allow the working of injectors on these hills, the water lost to be regained in drifting down the other side. hill or take another run for it. When the engine slipped working at full stroke and wide throttle she simply raised off the rails and bucked like a bronco, throwing sky rockets like star shells and often drawing fire from the enemy. Going down the hills was just as difficult, for the cars were so as to make it impossible for the crew to climb over and set all the brakes. So the conductor and two brakemen, the engineer with a steam jamb driver’s brake and the whistle signals did the best they could. 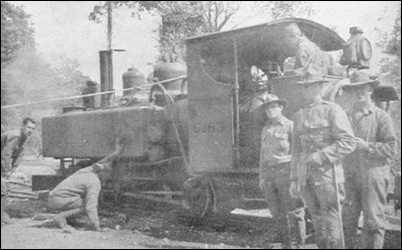 It was very difficult to hold the trains with wet rails, and a very disagreeable sensation it was to come down a steep hill in a blinding rain out of control, knowing that the roads were jammed with traffic and trucks loaded with artillery ammunition. luck that the engine did not hit a cannon, truck or a column of squads on this crossing, especially at night. 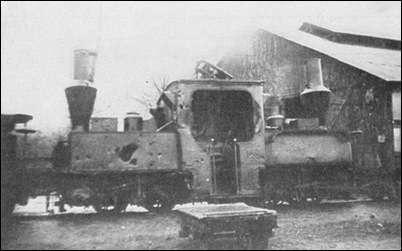 Within about two kilometers of this crossing the railroad entered the woods that extended to the trenches in the neighbourhood of Raulecourt and Mandres, where the 26th Division was ”broken in" and the first American battle of the war was fought. and start back to the trenches again with more loads, continuing thus until his stomach thought his throat was cut, and his feet had no place to sit down. After an unbelievable number of hours of this sort of work every muscle would be sore from his constant tussle with the fiendish throttle and sand lever. 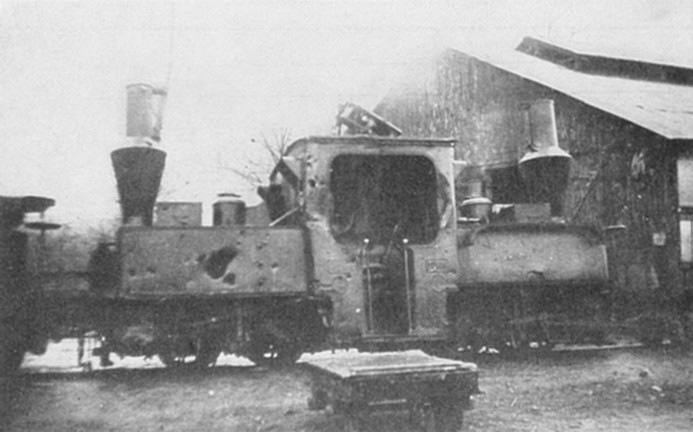 Often, after completing fifteen hours or more of such work he would expect to go home, but instead, would be at the "tender" mercies of an alleged Chief Dispatcher, who would send him over other lines of the division delivering empties to the ammunition dumps and loads to the front, until the man or machine was worn out. On the rare occasions that he was given ten hours (more or less) rest he was called upon again to repeat the same performance. and in all cases this was successfully accomplished. There was no lack of effort before and during the St. Mihiel offensive on the part of the men to make it the grand success that it was. We could have done much better, however, with quicker results and less effort and friction if we had but had the proper heads in the right place — jealousy between individuals and units and military "Red Tape" at critical times greatly reduced efficiency. The men, however, put forth a greater effort to counterbalance it. and there was very little system to train operations. So the men were mostly placed upon their own resources and the success of this unit particularly at this time was due to the fact that the rank and file were exceptionally good men and that they were facing the Hun. During the Argonne-Meuse offensive things were much different, the nature of the country was different, the track in rotten shape, poor facilities for eating and sleeping and more desperate fighting. But "Red Tape" was hopelessly cut. 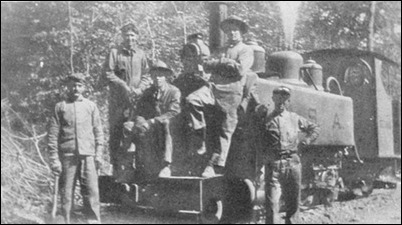 We covered so much territory that the men who knew engines were placed where their work meant something. Therefore the work of the light railway was carried out more successfully, under much more trying physical conditions, so far away from the back shops that each operating company had to make their own running repairs and ingenuity instead of "Red Tape" kept the trains moving. Night bombing and shelling was continuous and the men slept in all sorts of holes and dug-outs. 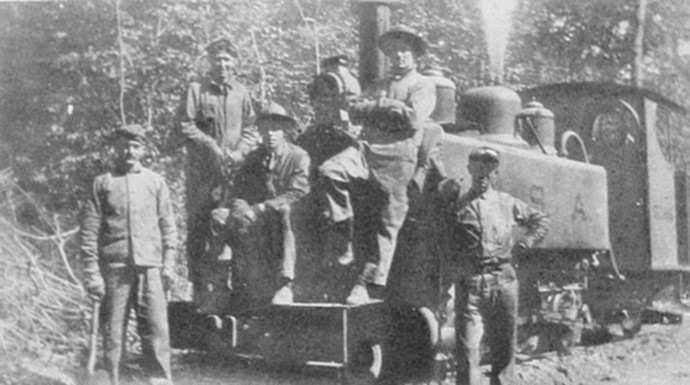 The engineers took water and coal when and where they could get it. Business was extremely good in every sense. After a few engines had siphoned water from a shell hole near "K-1"
in the shadow of Montfaucon a boot with a foot in it came to view. Farther up the line "Steam-Jam" Smith had found three dead "Crock-heads" lying peacefully in the bottom. Over the line from Dombasle to Montfaucon, ninety loads of rations and shells, besides six or eight loads of poison gas, delivered to the front was an average day. This meant an equal number of empties coming back and no more than eight cars on any train. There was but six hours between October 14th and November 11th, that there was nothing placed at the ration dumps for unloading. This was on account of derailments. During this offensive crews worked in territory where forty sections of Decauville track were shot out by shell fire in one kilometer. This entry was posted in WW1 Layout by Koala Creek. Bookmark the permalink.